ACCO Brands AY20020 - Monthly spread past, current and 4 future month calendars for quick reference. Extra pages include a 3 year reference calendar, future planning, a time zone map and contacts pages. Academic planning - manage the upcoming year with this classic planner. Plan your schedule without fear of distracting ink bleeding. Pages measure 8" x 12". Expand your organizational skills with specialized pages. Schedule detailed plans on the ruled monthly pages. Date range covers 14 months from July 2019-August 2020 for academic year planning and beyond. Ink bleed resistance - plan your schedule without fear of distracting ink bleeding. Keep track of important deadlines, special events and more with clear and simple organization. Our improved, high-quality paper is designed for superior ink bleed resistance, which keeps plans neat and legible. Monthly overviews - schedule detailed plans on the ruled monthly pages. Each two page spread includes past, current and 4 future month calendars for quick reference. 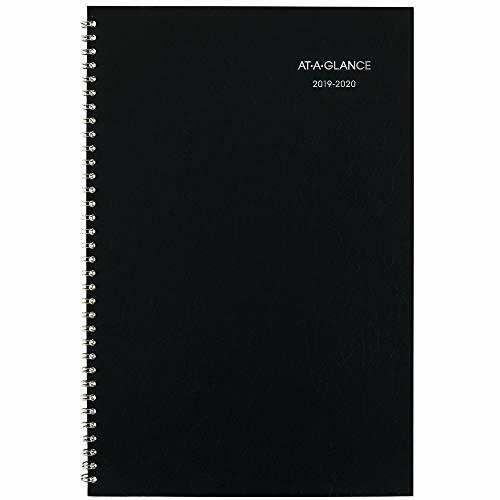 AT-A-GLANCE 2019-2020 Academic Year Monthly Planner, Large, 8" x 12", DayMinder, Black AY200 - Planner has a durable cover in black and the wirebound design helps keep pages secure for prolonged use. The at-a-glance dayminder monthly academic Planner covers 14 months from July 2019-August 2020 Our improved, high-quality paper is designed for superior ink bleed resistance, which keeps plans neat and legible. Blue Sky 115839 - High quality white paper provides clean writing space for jotting down your appointments, to-do's and reminders. Blue sky creates modern and sophisticated organizational planners and calendars to fit the scheduling needs of busy people - whether business professionals, college students, teachers, or anyone with appointments to make note of. Simple page designs add a touch of sophistication and offer plenty of room for all of your important information. Durable coated tabbed dividers are long lasting and make accessing information a breeze. Please find our other products including desk pad calendars, and laminated two-sided wall calendars, wire bound tabbed weekly and monthly planners with contact and notes pages to accommodate your scheduling needs, all in a variety of colors and patterns to suit your lifestyle and personality. Blue Sky 2019-2020 Academic Year Weekly & Monthly Planner, Flexible Cover, Twin-Wire Binding, 8.5" x 11", Enterprise - Planner features full monthly view pages for each month. July 2019 - june 2020, featuring 12 months of monthly and weekly pages for easy year-round planning. Separate pages with full weekly view for more detailed planning. This stylish planner will keep you organized everywhere you go. Previous and next month reference calendar on monthly view pages for long term planning. Major holidays listed, elapsed and remaining days noted. 2019-2020 Academic Planner - Weekly & Monthly Planner, July 2019 - June 2020, Flexible Cover,12 Monthly Tabs, 21 Notes Pages, Twin-Wire Binding with Two-Sided Inner Pocket, 5" x 8"
ACCO Brands AY20019 - Major holidays listed, elapsed and remaining days noted. Printed on high quality white paper for clean writing space. One month per two page spread features ruled daily blocks to keep handwriting aligned. July 2019 - june 2020, featuring 12 months of monthly and weekly pages for easy year-round planning. Printed on quality paper with a minimum of 30% post-consumer waste recycled material. Previous and next month reference calendar on monthly view pages for long term planning. Past, current and 4 future month reference calendars shown in left margin for quick date reference. Weeks are displayed from Sunday - Saturday. Planner features full monthly view pages for each month. Separate pages with full weekly view for more detailed planning. AT-A-GLANCE 2018-2019 Academic Year Monthly Planner, Medium, 7-7/8 x 11-7/8, DayMinder, Black AY200 - Perfect for teachers, administrators parents and other professionals who prefer this schedule. One month per two page spread features ruled daily blocks; weeks are displayed from Sunday - Saturday. Planner is wire bound with black covers. Academic date range covers 14 months from July - August with Julian dates. Monthly planner helps you prepare for upcoming events and more; academic date range covers 14 months from July - August with Julian dates. 3M Office Products 654-24VAD - Sheet size 3" X 3". Use to call out important information or leave notes in calendars or planners. Post-it notes stick securely and remove cleanly. Unique adhesive designed for use on paper or in planners. America's #1 favorite sticky note. Leave reminders or call out important information. 100 sheets/pad. Previous and next month reference calendar on monthly view pages for long term planning. Separate pages with full weekly view for more detailed planning. Major holidays listed, elapsed and remaining days noted. 24 pads/pack. Printed on high quality white paper for clean writing space. Post-it® notes in 3 in x 3 in stick securely and remove cleanly, featuring a unique adhesive designed for use on paper. Post-its Notes, America's #1 Favorite Sticky Note, Value Pack, 3" x 3", Canary Yellow, 24 Pads 654-24VAD - . Includes 24 canary yellow NOTE pads, 100 self-stick sheets per pad. Monthly planner helps you prepare for upcoming events and more; academic date range covers 14 months from July - August with Julian dates. Planner features full monthly view pages for each month. Each month is separated with durable, coated tabs that withstand constant use throughout the year. ACCO Brands AYC4704519 - Separate pages with full weekly view for more detailed planning. One month per two page spread features ruled daily blocks; weeks are displayed from Sunday - Saturday. Major holidays listed, elapsed and remaining days noted. One month per two page spread with ruled daily blocks to keep handwriting aligned. Telephone/ address pages also included. Printed on quality paper containing 30% post-consumer waste recycled material. Previous and next month reference calendar on monthly view pages for long term planning. 12 month july - June date range. Months are tabbed for easy navigation to any date. Planner is wirebound with charcoal gray Poly covers; 8-1/2" x 11" page size. AT-A-GLANCE 2018-2019 Academic Year Monthly Planner, Large, 8-1/2 x 11, DayMinder, Charcoal AYC47045 - Special pages: 3 year calendar reference, metric conversions, time Zone map, contact pages and notes pages. July 2019 - june 2020, featuring 12 months of monthly and weekly pages for easy year-round planning. Planner features full monthly view pages for each month. 8-1/2" x 11" page size. 24 pads/pack. Monthly academic planner is great for keeping track of long term plans. Printed on high quality white paper for clean writing space. ACCO Brands SK20019 - Our improved, high-quality paper is designed for superior ink bleed resistance, which keeps plans neat and legible. Monthly views - great for long-term planning, each month covers two pages. Monthly planner helps you prepare for upcoming events and more; academic date range covers 14 months from July - August with Julian dates. Contacts. Post-it notes stick securely and remove cleanly. Unique adhesive designed for use on paper or in planners. America's #1 favorite sticky note. Leave reminders or call out important information. 100 sheets/pad. One month per two-page spread. Special pages include: important dates, contact pages, metric conversions, and holiday listing. AT-A-GLANCE 2019 Monthly Planner, DayMinder, 8" x 12", Large, Ruled, Black SK200 - Great for long-term planning, each month covers two pages. Telephone/ address pages also included. Printed on quality paper containing 30% post-consumer waste recycled material. Features ruled daily blocks for neat scheduling and six months of reference calendars. July 2019 - june 2020, featuring 12 months of monthly and weekly pages for easy year-round planning. Our improved, high-quality paper is designed for superior ink bleed resistance, which keeps plans neat and legible. ACCO Brands 702600519 - Keep track of important deadlines, special events and more with clear and simple organization. Telephone/ address pages also included. Printed on quality paper containing 30% post-consumer waste recycled material. Months are tabbed for easy navigation to any date. Contacts. Year-round planning - large planner covers 15 months from January 2019-March 2020 Keep track of important deadlines, special events and more with clear and simple organization. Monthly overview - great for long-term planning, each month covers two pages Features unruled daily blocks for open scheduling and six months of reference calendars Pages measure 9" x 11". One month per two page spread features ruled daily blocks; weeks are displayed from Sunday - Saturday. Planner is wirebound with charcoal gray Poly covers. AT-A-GLANCE 2019 Monthly Planner, 9" x 11", Large, Black 7026005 - Includes: 3 year reference calendar. Contacts. Our improved, high-quality paper is designed for superior ink bleed resistance, which keeps plans neat and legible. Double-sided poly-pocket. Take charge of your schedule with classic style. Pages measure 8" x 12". Sturdy design - take charge of your schedule with a planner that will last all year. Simon & Schuster - July 2019 - june 2020, featuring 12 months of monthly and weekly pages for easy year-round planning. Monthly overview - great for long-term planning, each month covers two pages Features unruled daily blocks for open scheduling and six months of reference calendars Pages measure 9" x 11". Contacts. Year-round planning - large planner covers 15 months from January 2019-March 2020 Keep track of important deadlines, special events and more with clear and simple organization. Of course, no book for teen girls would be complete without taking a look at how to maintain friendships with boys and deal with commitment issues and break-ups with boyfriends. Stay on top of every deadline, special events and more with clear organization and professional style. Ink bleed resistance - plan your schedule without fear of distracting ink bleeding. Bonus pages included; printed on quality paper with a minimum of 30% post-consumer waste recycled material; wire bound; 7-7/8" x 11-7/8" page size. Carnegie also provides solid advice for older teens beginning to explore their influence in the adult world, such as driving and handling college interviews. How to Win Friends and Influence People for Teen Girls - Separate pages with full weekly view for more detailed planning. Printed on high quality white paper for clean writing space. The carnegie techniques promote clear and constructive communication, tolerance, emotional sensitivity, praise rather than criticism, and a positive attitude—important skills for every girl to develop at an early age. Donna dale carnegie, invaluable lessons to the newest generation of young women on their way to becoming savvy, brings her father’s time-tested, daughter of the late motivational author and teacher Dale Carnegie, self-assured friends and leaders. - For all our books; cargo will be delivered in the required time. Pages measure 8" x 12". Sturdy design - take charge of your schedule with a planner that will last all year. 12 month july - June date range. One month per two-page spread. Special pages include: important dates, contact pages, metric conversions, and holiday listing. Features ruled daily blocks for neat scheduling and six months of reference calendars. 8-1/2" x 11" page size. Year-round planning - large planner covers 14 months, December 2019-January 2020 Ink bleed resistance - plan your schedule without fear of distracting ink bleeding Our improved, high-quality paper is designed for superior ink bleed resistance, which keeps plans neat and legible. John Frieda Frizz, 1.69 Ounces - Telephone/ address pages also included. Printed on quality paper containing 30% post-consumer waste recycled material. Our improved, high-quality paper is designed for superior ink bleed resistance, which keeps plans neat and legible. Monthly views - great for long-term planning, each month covers two pages. Planner is wirebound with charcoal gray Poly covers. Future planning.